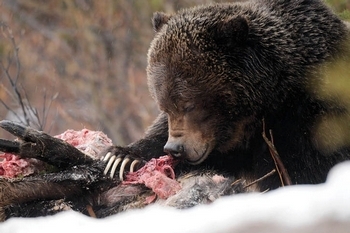 Photo credit: A large male grizzly feeds on the carcass of a moose that was killed on the Canadian Pacific Railway April 5. Two young moose have been struck and killed on the train tracks in Banff National Park this month. Parks Canada officials say two male yearlings were killed less than a week apart; the first one struck April 5 near Silver City and the second one near Hillsdale on April 11. “Both of these moose were disposed of at secure locations away from the transportation corridors,” said Steve Michel, a human-wildlife conflict specialist for Banff National Park. Though nearly wiped out by overhunting in the late 1800s, local moose populations began to recover once protected within the national parks. Moose were often seen in the Bow Valley, along the Bow Valley Parkway, through the mid 1900s, but by the mid-1990s a moose sighting was a rare event. In 1994, concerns over declines in moose numbers, coupled with the fact the status of the population was unknown, led Banff National Park to begin a moose research program. That study concluded there was no definable Bow Valley population, but rather a constant trickle of dispersing individuals arriving in the valley from adjacent watersheds. The reasons for the decline at the time were complex, involving a variety of factors such as loss of habitat due to forest encroachment and fire suppression. The study also noted an increase in prevalence of giant liver fluke infection – a parasite hosted and shed by elk – but harmful to infected moose. In addition, increasing elk density in the central Bow Valley, which attracted wolves, and increased highway and railway mortality also took their toll on the population. Parks Canada is not currently studying moose and does not have an accurate population estimate, but officials say perhaps half a dozen moose have been using the Trans-Canada Highway crossing structures. From 1996 until this month, 284 moose crossings have been recorded. It’s suspected it is only a few moose responsible for the bulk of the crossings. “There are so few moose in the Bow Valley that likely what we are seeing are the preferences of a few individuals,” said Tony Clevenger, lead scientist on Banff’s highway mitigation research project. Clevenger said that most moose crossings have occurred in the structures between the Sunshine interchange and Castle Junction. About 80 per cent of the crossings have occurred at the two overpasses, while Healy underpass near the Sunshine interchange has seen about 10 per cent of the crossings. Clevenger said one new large span underpass near Lake Louise – which is about twice the size of the Healy underpass – has had about 10 per cent of crossings, even though it’s only been monitored for three years. “Moose appear to prefer large passages, particularly overpasses and the large span underpasses,” said Clevenger, a wildlife biologist with Montana State University’s Western Transportation Institute. Since the wildlife crossing structures were built, more than 200,000 wildlife crossings have been recorded. Eleven species of large mammals have used the structures, including grizzly and black bears, wolves, coyotes, cougars, moose, elk, deer, bighorn sheep, wolverine and lynx.